Video: Court Removes Barriers to Help the Homeless, Superior Court of San Diego County. Community courts are an experiment in community-based justice. Like other collaborative justice courts, community courts aim to improve efficiency in judicial proceedings, match sanctions and services to offenders, and build bridges between public and private agencies that serve offenders. 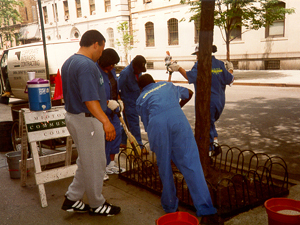 Community courts focus on quality-of-life crimes and on cleaning up neighborhoods that are deteriorating from crime and neglect. The courts encourage community groups to identify neighborhood problems and become involved in developing solutions. Each community court is unique because it is developed in response to community priorities. For instance, another community court, the Red Hook Court in Brooklyn, focuses on family issues, while a community court in Harlem focuses on juvenile justice. All community courts include principles of community involvement, balanced and restorative justice, accountability, and linkage to treatment or other services. The San Francisco Community Justice Center (CJC), handles a broad array of cases targeting those who are most at risk of re-offending and who have the greatest impact on public safety. Both non-voluntary and voluntary participants of the CJC have access to a large range of supportive services. Also operating at the CJC is a unique partnership with the District Attorney’s office to host the Community Court panelists, a project of California Community Dispute Services. The panelists are comprised of a body of San Francisco residents who talk to CJC participants about the impact that their criminal behavior has had on the community. Currently there are 26 community courts nationally, with more planned. Some community courts, such as the one in Orange County, integrate programs and services from a range of existing collaborative justice courts. The Orange County Community Court provides a one-stop location at which comprehensive services will be available to help offenders who are mentally ill, addicted or homeless. Homeless courts are special court sessions held in a local shelter or other community site designed for homeless citizens to resolve outstanding misdemeanor criminal warrants (principally "quality-of-life" infractions such as unauthorized removal of a shopping cart, disorderly conduct, public drunkenness, and sleeping on a sidewalk or on the beach). Resolution of outstanding warrants not only meets a fundamental need of homeless people but also eases court case-processing backlogs and reduces vagrancy. Homeless people tend to be fearful of attending court, yet their outstanding warrants limit their reintegration into society, deterring them from using social services and impeding their access to employment. They are effectively blocked from obtaining driver's licenses, job applications, and rental agreements. In 1989 the first homeless court was established as an outgrowth of San Diego's Veterans' Stand-Down Program. That program annually offers services to the homeless, the majority of whom are veterans. The San Diego Homeless Court meets monthly, alternately at Saint Vincent de Paul (San Diego's largest homeless shelter) and the Veterans Village of San Diego. Los Angeles started its homeless court in November 2000. This court is designed on a model similar to the court in San Diego, with court sessions held at community facilities that serve the homeless, such as the Salvation Army. The court addresses quality-of-life offenses that have gone to warrant and provides sentencing, involving participation in treatment and community service, that can clear the offense. Courts in Alameda and Ventura Counties have also begun holding homeless court sessions. The Ventura Court's work was presented at the 2002 National Association for Court ManagementConference. Special court sessions held in the community by the Ventura court address outstanding cases and unique problems of criminally accused homeless individuals. This approach reduces the need for numerous hearings, saving court time and costs. These courts combine plea bargaining with alternative sentencing that substitutes counseling, volunteer work, and participation in agency programs for the traditional fines, public work service, and custody. Defendants are given credit for having entered a shelter, done volunteer work, or enrolled in Alcoholics Anonymous or other self-help and education programs. The San Diego Homeless Court received initial federal funding from the Bureau of Justice Assistance. The San Diego Association of Governments (SANDAG) conducted an evaluation that noted over 700 cases (for 266 participants) were resolved between October 1999 and February 2001. Data collected from participant surveys suggest that individuals' participation in the homeless court program improved their attitudes toward law enforcement and increased their satisfaction with court processes, court staff, and the court system as a whole. View the SANDAG 2001 report, San Diego Homeless Court Program: A Process and Impact Evaluation. The Collaborative Justice Courts Project started the Homeless Court Outreach Initiative with collaborative justice courts to enable similar courts to benefit from the experiences of their peers. The initiative gathered like-minded practitioners at a 2003 forum to share their programs and case processing strategies.